The Surrey Eagles will pay their first visit of the season to the Poirier Sports and Leisure Complex tonight to face the Coquitlam Express. It's the first of eight meetings between the two lower mainland rivals. The teams met twice in the pre-season. The first game was a 4-4 tie in Coquitlam while the Eagles won 4-2 in the return match-up at the South Surrey Arena. 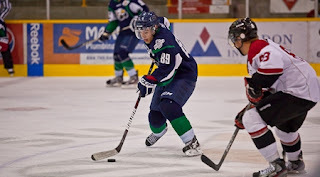 Surrey is coming off a hard fought 5-4 loss at the hands of the Alberni Valley Bulldogs on Sunday. Since then, the team released goaltender Edward Dyson, who allowed five goals on 31 shots in the loss to the 'Dogs, and added Mississauga, Ontario native Michael Santaguida to the roster. Meanwhile, Demico Hannoun has had a strong start to the season, leading the team in points (7) and assists (4). The 16-year-old has also scored in both of his last two games and has five points in that span. The Birds have yet to win two games in a row this season and sit with a record of 3-3-0-0, good enough for third in the Mainland Division. The Express enter tonight's action atop the Mainland Division with a record of 4-1-0-0. Their only loss of the season came last Sunday against the Victoria Grizzlies. A big reason for Coquitlam's early season success is the strength of their penalty kill as they have yet to allow a power play goal in 26 man advantage opportunities for their opponents. Cole Huggins has been a wall in goal for the Express as well. The native of Englewood, Colorado leads the league in goals-against-average (0.86) and save percentage (.974). He also has two shutouts in four starts and was named the BCHL Player of the Week after the Showcase weekend at the beginning of the season.